Selkirk RFC staged its Royal Bank of Scotland Rugby Force Weekend last Saturday and Sunday. And, acording to director of rugby, Ewen Robbie, it was a great success. 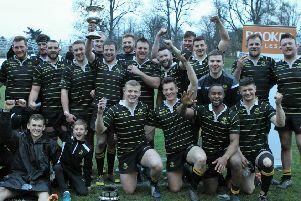 The aim was to engage with families and the wider community, while there was a chance to win family memberships of the club, plus two rugby matches on Saturday – Selkirk YC v Kelso Quins (17-10), and Selkirk v Marr, which Marr won 22-7. On Sunday, the Rugby Force got stuck into various clean-up tasks around the club, ahead of a ‘thank you’ barbecue for all helpers. Youngsters who took part in a skills clinic are pictured with Scotland sevens star and coach Scott Wight.